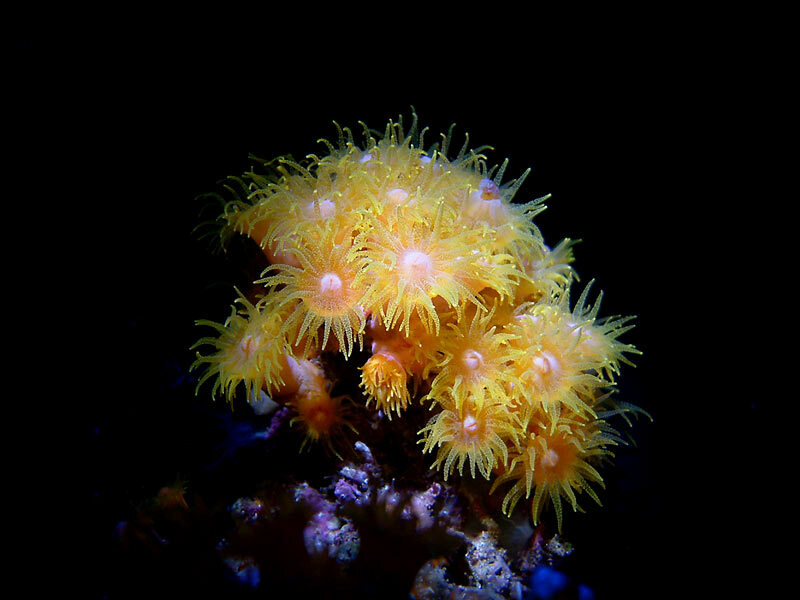 My reason for setting up the suncoral tank was to allow me to feed these hungry corals easily on daily basis. It housed an adorable tiny eel that I caught during a collection trip near Galveston, Tx. This tank was taken down after four years, when the new 400g came to live. 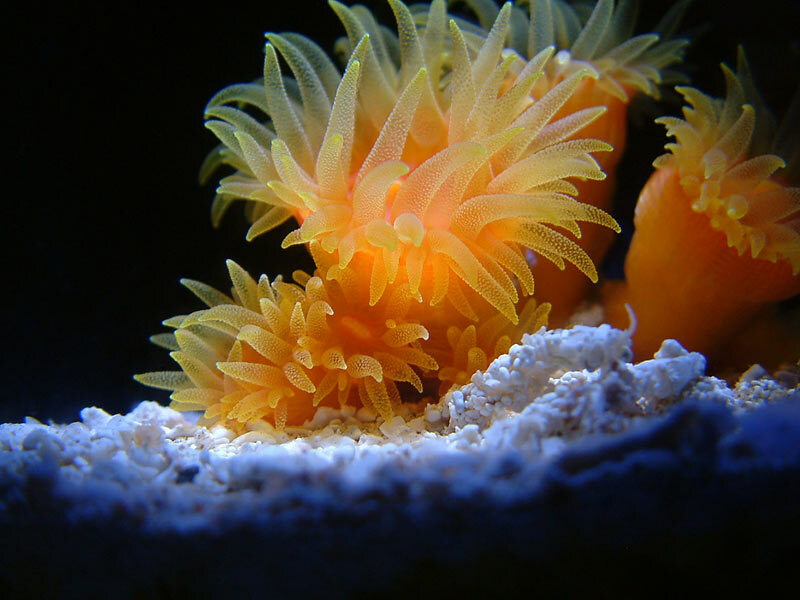 The suncorals were moved to my new Frag Tank. 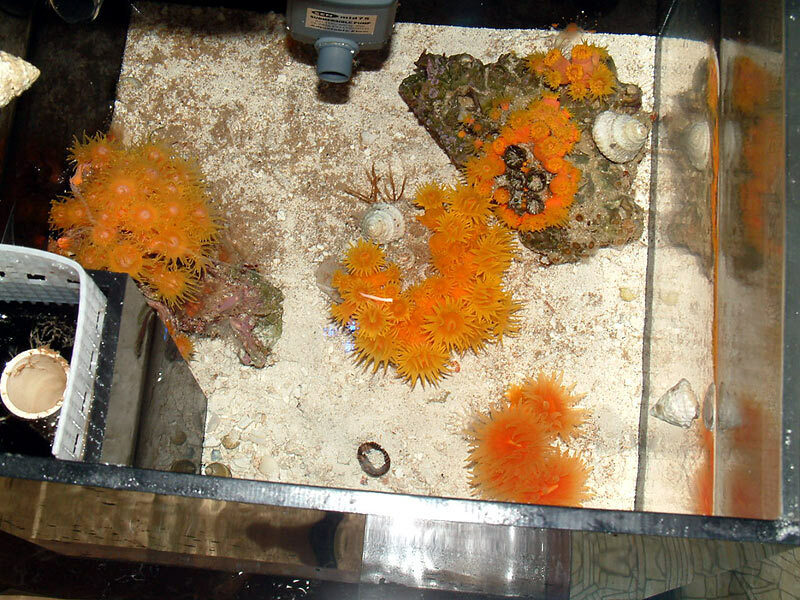 During 2007, I decided to relocate my deteriorated suncoral because I had stopped feeding it regularly in my huge reef tank. I moved it out of the reef and into my suncoral tank, a small 9" x 9" x 9" cube that is set up over the sump. 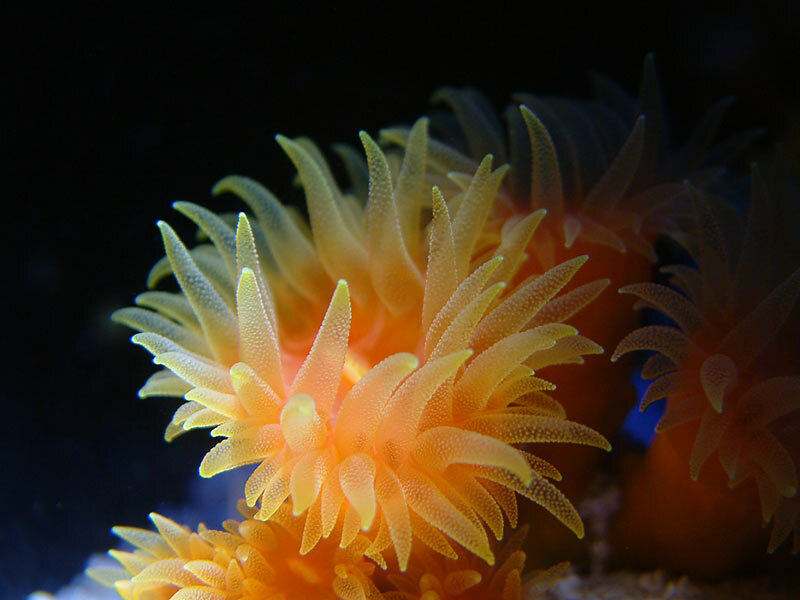 It is very easy to target feed the coral polyps each night in this small area, plus it adds something pretty to see when I'm in the fishroom. The small tank sits on the top edge of the sump. A small pump pushes water into the pico tank, and it drains out via an overflow back into the sump. With it tied into the main tank, I don't have to worry about skimming, heating, dosing, nor top off because all of this is already in place for the reef. The suncoral tank piggybacks on the system with zero maintenance. Below, you can see it next to the Euro-Reef CS12-2 protein skimmer. 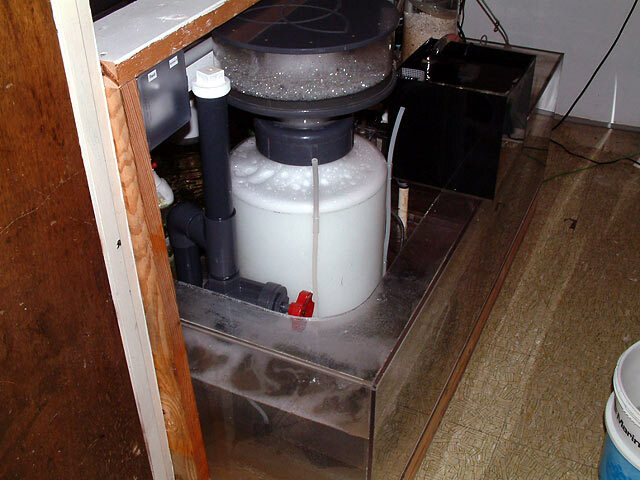 The skimmer is 12" wide and 30" tall, and the sump is 60" long by 34" wide by 16" tall. The main coral has been with me 3.5 years at the time of this writing, and is in the center of this tank. With nightly feedings, it took about 90 days to get it back to this point, and while it looks good in this picture, that is only half of what the colony was. With continued feedings, it'll regain its former glory. The orange coral (bottom left) is a Dendrophyllia that is doing very well with babies sprouting at its base. The rock with a few polyps is a very recent addition. Pictured as well is a tiny eel I added months ago that I captured during a collection trip near Galveston, Tx. The suncoral in the back of the tank is the branching kind. 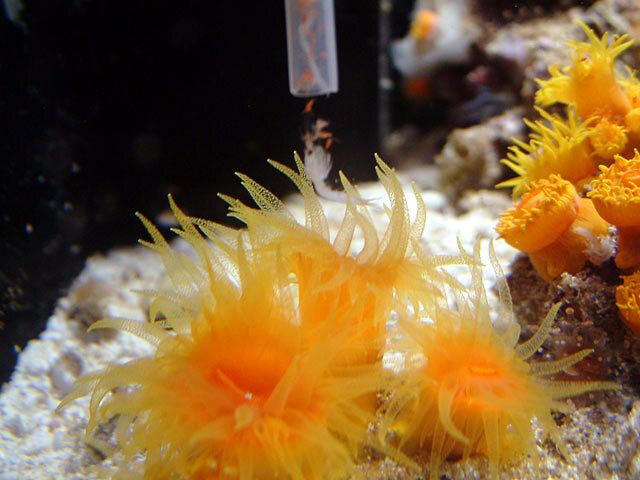 A tiny pump creates some in-tank flow. First the food: mini mysis and cyclop eeze thaw out in a small bowl of tank water. The pipettes are those small ones that come with a refractometer. 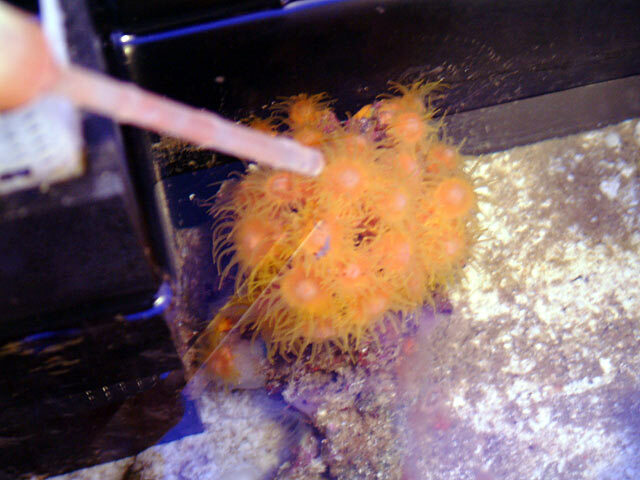 Once thawed, I turn off the feed to my suncoral tank, and then squirt a small puff of food over each polyp every gently. I don't want the coral to retract, but rather catch the food. Three pipettes' worth of food is offered each night, so it really isn't a lot of food. 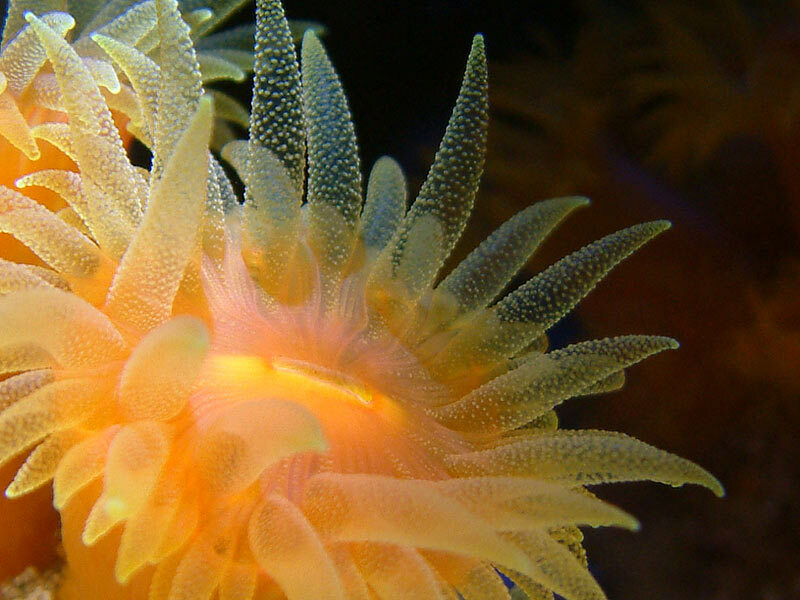 The coral is target fed to avoid waste, keeping the food where it needs to go. After 10 minutes, I may feed them again. You can feed them two or three times in a 15 minute period. However, if you feed them daily, once seems to be enough to encourage growth. Don't forget to turn the feed pump back on. 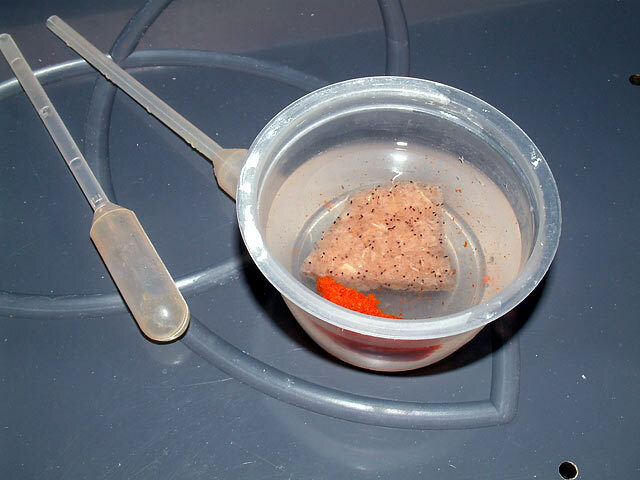 If you have to do this in a tank with thieving shrimp, cut off the top of a 2-liter bottle and use that as a feeding dome. Drill small holes in the dome. Press it down over the coral so that it sinks into the sandbed and stays in place. Squirt the food through the top of the dome where the cap used to screw on. Here is the small Dendrophyllia colony. 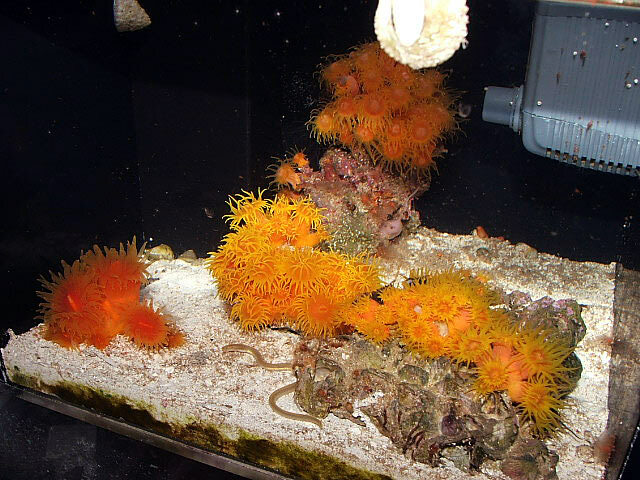 There are 4 major polyps and 6 smaller babies budding around the base. 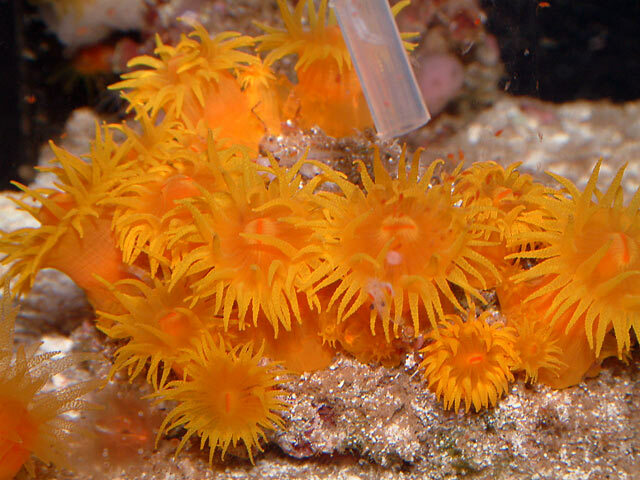 This tank also has a few hitchhiker Orange Ball Anemones. 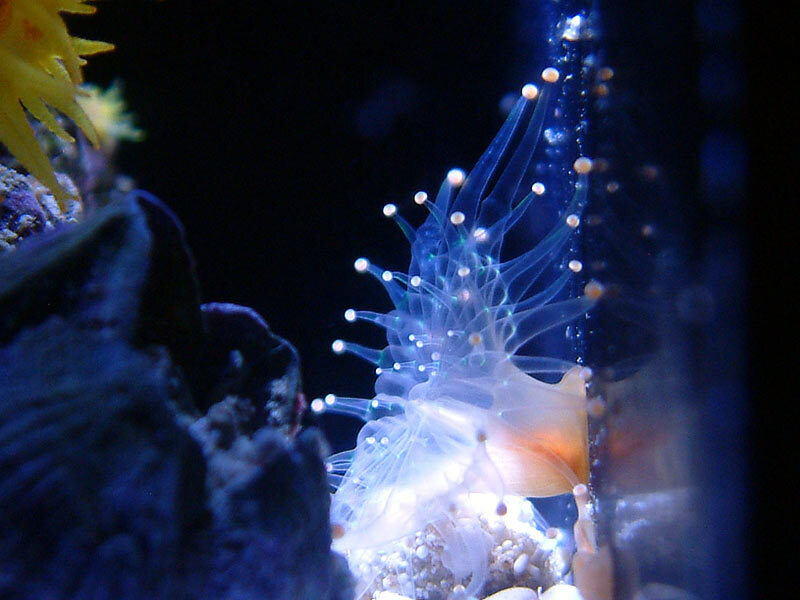 Since they are in my reef, some snuck in here. 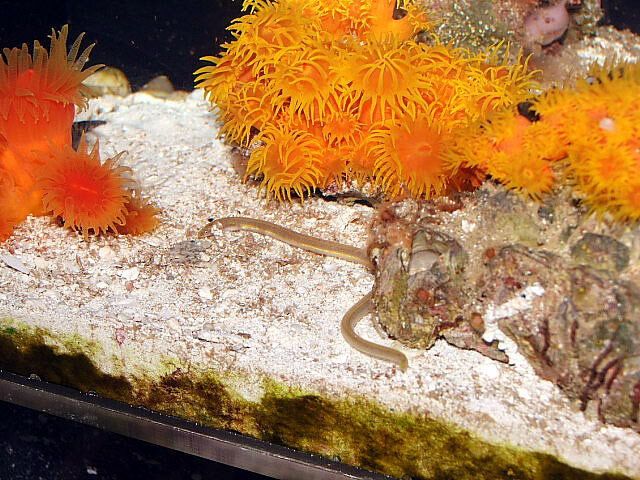 Another shot of the tiny eel. This tank doesn't have any lighting as the corals don't require it. They are non-photo synthetic, and rely upon food to live. The lack of direct lighting prevents nuisance algae from taking hold, but I do keep a few snails in the tank to keep the walls clean. During the late night hours, occasionally I'll turn on some blue LEDs to shine down on the corals for my own personal pleasure.